The Saga Group, based in the United Kingdom, was founded in 1951 as a privately owned tour company offering holiday packages within the U.K. to travelers aged 60 and over. Saga soon expanded their offerings to include European destinations and later in Asia. In 2011, Saga celebrated its Diamond Anniversary and nowadays, Saga bills itself as a cruise, tour and resort company "for today's over 50s" (the qualifying age dropped from 60 to 50 in 1995). In 1975, Saga Holidays offered its senior customers a world cruise for the first time, and began to build a portfolio of at-sea offerings. But it wasn't until almost 20 years later in 1996 that Saga bought its first wholly owned cruise ship -- Cunard's Sagafjord, which was renamed Saga Rose. In 2003, Saga doubled its fleet with the purchase of a second and similar cruise ship -- Cunard's Caronia (formerly Vistafjord), which was now known as Saga Ruby. Sagafjord and Vistafjord sailed as "sister ships" for Cunard, though they were built eight years apart, in 1965 and 1973 for Norwegian America Line. Cunard bought the ships form an interim company -- Norwegian America Cruises -- and they are close, but not entirely identical in design. In 2006, Saga began operating the 352-passenger Spirit of Adventure (Deilmann's former Berlin), in a short-lived attempt to attract a younger demographic by lowering the minimum age to 21-years-old. The cruises, with a strong enrichment program hosted by expert lecturers, explored the Mediterranean and Black Seas, the Middle East, Indian Ocean and Southeast Asia. Saga Pearl II joined the fleet in October 2009. That ship was formerly known as Astoria and sailed with Transocean Tours. A few months later Saga Pearl II transferred to Saga's Spirit of Adventure sister brand as the Quest for Adventure, but 18 months later it reverted back to its original name and now no longer offers adventure itineraries. 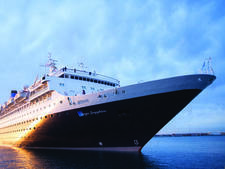 In 2012, it introduced Saga Sapphire, which debuted in 1981 as Hapag-Lloyd's Europa. (An extensive refit preceded the launch). 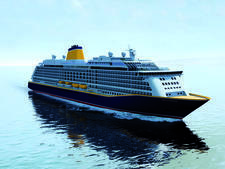 In 2015, Saga confirmed its first-ever new builds -- Spirit of Discovery, which launches in 2019; and in a nod to one of its old ships, Spirit of Adventure, which will launch in 2020. The line has an option on a third ship, and have intimated -- but not confirmed -- that they will exercise this option. The ships are being built at the Meyer-Werft shipyard in Germany and will each carry 999 passengers. Saga Holidays is part of the larger Saga Group, which provides various services to seniors in the U.K. In addition to its travel division, Saga Group offers flexible and affordable healthcare and insurance options, and its own magazine geared toward a more mature audience. But it is Saga Cruises that will interest North Americans most. The second new build from U.K. cruise line Saga Cruises will launch in summer 2020 and will be a sister to Spirit of Discovery, which is set to launch the year before. Saga Cruises offers a classic cruising experience that is elegant, yet informal and comfortable. Passengers will find today's expected amenities such as Internet cafes, modern (but small) spas with hair salons and fitness centers. But do not expect a casino, shopping malls or lavish shows because Saga passengers like low-key entertainment, libraries, games of all sorts and a relaxed yet good-mannered social life. A traditional serenaded English tea is served every afternoon in two locations, and ballroom dancing and cabaret-style entertainment is presented nightly. Saga's ships are operated exclusively for passengers over the age of 50 (and a minimum age of 40 applies for all traveling companions). On a typical two-week cruise, the average age will be more like 70, with most still quite active, eager to see the world and to travel with like-minded souls. North American passengers are welcome onboard, but because the line was not marketed to them until recently, the vast majority of passengers are still British. Cruise and Tour Reservations, a division of U.S.-based Yankee Holidays, Inc., handles Saga cruise reservations exclusively for North American passengers. Saga operates just two ships -- Saga Sapphire and Saga Pearl II. Saga Pearl II was bought by the group as the 18,591-tonne, 446-passenger Astoria at an auction in August 2009 as a replacement for Saga Rose, which retired in 2009. 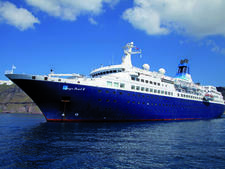 Astoria was refurbished and relaunched, debuting as Saga Pearl II debuted in March 2010. Saga Pearl II will retire from the fleet in 2019. The 706-passenger Saga Sapphire started sailing as the line's flagship in March 2012, replacing Saga Ruby -- the last cruise ship to be built in the U.K. -- which retired at the start of 2014. In 2015 it placed an order for a new cruise ship, Spirit of Discovery, which will launch in Summer 2019. It has confirmed a second new-build for delivery in 2020. The all-balcony ship, 999-passenger ships, will be built at the Meyer Werft shipyard in Germany. ITheyt will have a combination of 540 suites and cabins, each with a balcony. Around 15 percent -- or 81 cabins -- will be for solo passengers. Spirit of Discovery replaces Saga Pearl II in 2019 and Spirit of Adventure replaces Saga Sapphire in 2020. Saga's ships sail a variety of itineraries, from a four-night Western Europe sampler to a 114-night world voyage. Regardless of length or destination, all cruises embark either from Dover or Southampton. During the summer, the line focuses on regions including the Baltic, British Isles, Mediterranean and the Norwegian fjords. During the winter months, the ships may be sailing in warmer climes as part of a world cruise or plying the waters of the Canary Islands or Caribbean.